First class services without first class prices. That's what Jetblue is hoping to sell to its customers starting Sunday, when the airline launches a new service called "Mint." It will begin with only the New York to Los Angeles route, and will offer the kind of amenities usually seen on international flights. Billing it "coast-to-coast without the cost," travelers can expect seats that become private suites with a door, food lifted from the menu of a trendy New York City restaurant and tiny bottles of fancy beauty products. There's also a signature cocktail and organic ice cream from a Brooklyn scoop shop, all for about $600 a ticket, each way. It's not exactly flying behind the first class curtain (there is, in fact, no curtain separating the cabins) but it's close, and built for the everyday business traveler willing to spend a little more. "I think they can expect a refreshing surprise," said Brad Farmerie, the executive chef of Saxon + Parole, the restaurant behind Mint's food. He said passengers will be offered options like truffled portobello mushroom mousse for dinner, and French toast stuffed with banana and homemade Nutella for breakfast. 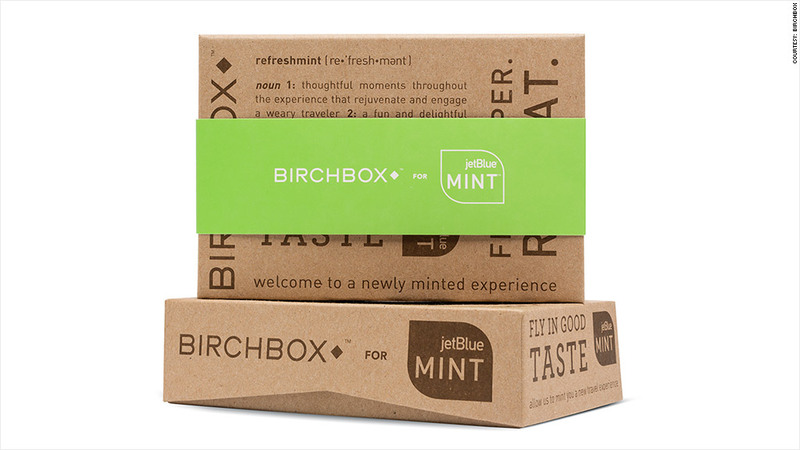 The beauty company Birchbox will supply the amenities for Mint, with gift boxes filled with products like moisturizers, sunscreens and hair products. Birchbox co-founder and co-CEO Katia Beauchamp said that she hopes the kits will make traveling easier "and more glamorous!" There are gift boxes for women, and separate ones for men. The cost for all this luxury? Seats are currently offered at $599 one way, if booked by next week for travel later this year. A non-refundable economy class ticket taken during a similar time is about $330. All the amenities are included with the ticket price. JetBlue's new service comes at a time when more and more airlines are building in extravagant options for fliers willing to spend. 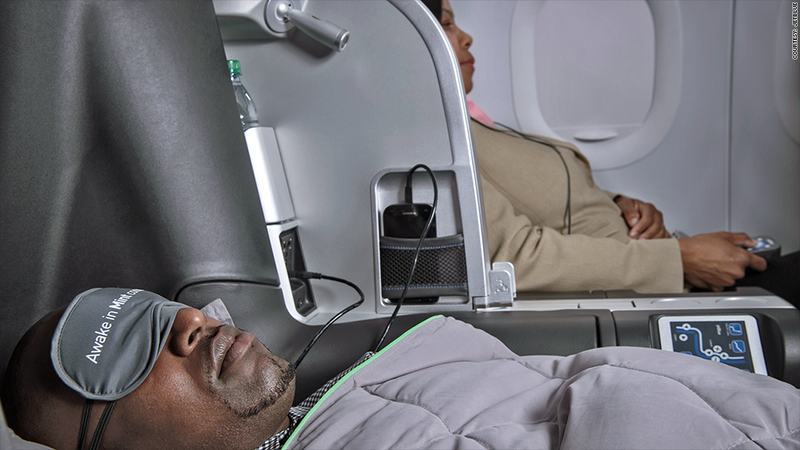 AirFrance recently announced its new La Première cabin, which has four private suites and will debut in September. 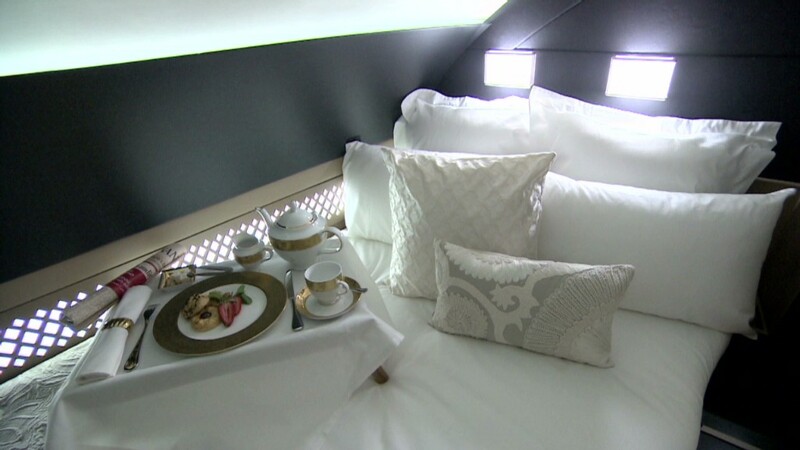 Etihad Airways' A380 offers a one-bedroom "residence" on one of its long-haul planes departing from London, at a cost of $21,000 a ticket. While all that luxury comes with a hefty price tag, JetBlue's decision to keep things less astronomical may signal a trend that combines the casual with the costly. Like Virgin Atlantic's rather whimsical new option for its higher-paying passengers -- a onesie pajama bodysuit with feet. The airline dubbed the onesie a "fun alternative" for the first class flier.